"Columbian farmers in the windswept Andes Mountains of South America first discovered and cultivated the potato some 7,000 years ago. They were impressed by its ruggedness, storage quality and its nutritional value. Western man did not come into contact with the potato until as late as 1537 when the Conquistadors tramped through Peru. And it was even later, around 1570, that the first potato made its way across the Atlantic into Europe. In the Spanish Colonies, potatoes were considered food for the under classes. When brought to the Old World, they would be used primarily to feed hospital inmates. About 1780 the people of Ireland adopted the rugged food crop. The primary reason for its acceptance in Ireland was its ability to produce abundant, nutritious food. Unlike any other major crop, potatoes contain most of the vitamins needed for sustenance. Perhaps more important, potatoes can provide this sustenance to nearly 10 people on an acre of land. This would be one of the prime factors causing a population explosion in the early 1800s. Of course, by the mid-1800's the Irish would become so dependent upon this crop that its failure would provoke a famine. In France the potato was imposed upon society by an intellectual. Antoine Augustine Parmentier saw that the nutritional benefits of the crop combined with its productive capacity could be a boon to the French farmer. He was a pharmacist, chemist and employee of Louis XV. Parmentier discovered the benefits of the potato while held a prisoner by the Prussians during the Seven Years War. He was so enamored by the potato that he determined that it should become a staple of the French diet. After failing by conventional means to convince Frenchmen of its advantages, he came up with another means of making his point. Parmentier acquired a miserable and unproductive spot of ground on the outskirts of Paris. There, he planted 50 acres of potatoes. During the day, he set a guard over it. This drew considerable attention in the neighborhood. In the evening the guard left his post and the locals came to see what all the fuss was about. Believing this plant must be valuable, many peasants "acquired" some of the potatoes from the plot, and soon were growing it in their own garden plots. Their resistance was overcome by their curiosity and desire to better their lot with the obviously valuable new produce. Soon the potato would gain wide acceptance across Europe and eventually make its way back over the Atlantic to North America. As time passed, the potato would become one of the major food stuffs of the world, but not without a few bumps in the road. The 1840's saw disastrous potato blight. This terrible disease was caused by a fungus known as Phytophthora infestans. With the devastation of potato crops throughout Europe came the destruction and dislocation of many of the populations that had become dependent upon it. The Potato Famine in Ireland would cut the population by half (through both starvation and emigration). An effective fungicide was not found until 1883 by the French botanist, Alexandre Millardet. Today, the potato is so common, plentiful and pervasive in the Western diet that it is taken for granted." There are many, many ways the potato is cooked and eaten by people in every country in the world today, and recently I learned about a recipe that some people know about and others have never heard of. This particular recipe was handed down to Collette Dishman when she was only 12 or 13 years old. When Collette growing up, one of the things she enjoyed doing was being in the kitchen while her mother cooked. This particular recipe passed on to Collette from her half-sister is for Potato Candy. If you are among those who have never heard of potato candy, you are probably thinking it couldn’t possibly be any good. But that old saying applies to this situation for sure, "the proof is in the pudding." It is delicious. I had heard about making candy from potatoes, but I must admit it didn’t sound like anything I would care about trying. But after sampling some prepared especially for me by Collette, I was convinced that I needed to add her recipe to a collection of favorites I have for the holidays. I believe even Antoine Augustine Parmentier would enjoy a sample of Collette’s recipe as much as I did. Collette's potato candy made from a recipe shared with her when she was around 12 years old. Wash and boil a tennis ball size potato leaving the skin on. When tender, drain and rinse with cold water. When the potato is cool to the touch, remove the peeling. Mash the potato, and then gradually add 1/2 to 3/4 bag of a 2 pound bag of powered sugar until a consistency of stiff biscuit dough is reached. Sprinkle additional powered sugar on dough board. Roll out the dough by patting by hand or with a rolling pin if you prefer. 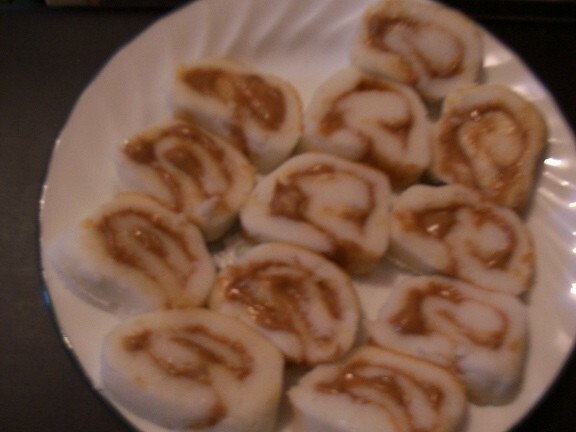 Using your favorite peanut butter, spread a couple of tablespoons, or more if you wish, on top of the dough. Begin rolling up the dough from one side to form a log. Slice into ½ inch thickness. This candy can be eaten right away or if you prefer, it can be refrigerated for a few minutes before serving. Makes about 40 1/2 inch slices. Multiply the recipe for a larger serving. Enjoy!